Looking for the best spray tan solution for sale? Bronzz is your source for the best spray tan solution and sunless tanning liquid anywhere in the world. Take your airbrush tanning business or at home sunless tan to the next level today with Bronzz, the best spray tan solution for sale anywhere! Bronzz was created by the owner of a multi tanning salon chain with one idea in mind, to offer the most realistic, longest lasting, even fading spray tan solution anywhere in the world. 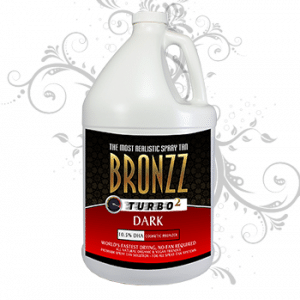 Our customers realize that Bronzz is not only the best solution for airbrush tanning machines made, it is also often up to 50% cheaper than our competition! Bronzz airbrush tanning solution is available in sample sizes as well as half gallons and gallon sizes of spray tan liquid. Whether you are interested in our 1 hour Turbo 2 (drys in less than one hour, allowing your customers to shower in as little as 60 minutes “After Spray Tan session” or our premium venetian line, you can rest assured that our spray tan machine liquid is going to take your airbrush tan shades above the rest. When it comes to the best spray tan solution it doesn’t mean it has to be the most expensive. Bronzz products will increase your word of mouth airbrush tanning business starting with your first spray tan session! Looking for specials and airbrush tanning solution promotions? Like the Bronzz spray tan solution supplier Facebook page today. Bronzz spray tanning store offers a full line of sunless airbrush tan solutions and spray tan solution products including norvell spray tan solution, bronzz spray tanning solution, bronzz airbrush tan solution, norvell airbrush tan solution, norvell airbrush tanning solution at the best prices in the industry with same day shipping! We also offer spray tan tents, tanning tents and airbrush tan tents for sale.